LEN Design Concepts has a Kickstarter campaign up and running for their DungeonStone Modular Dungeon Terrain: Abandoned Mines. LEN Design Concepts would like to introduce the DragonStone Modular Dungeon System; Abandoned Mines Theme set. 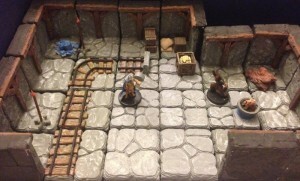 A beautifully hand-crafted modular dungeon system that is both durable and affordable. This gaming terrain would enhance any roleplaying game that uses any setting or system, provided of course that it is using 25mm scale miniatures.